Image caption Tristram Hunt said his "personal commitment remained to the students"
The shadow education secretary has defended his decision to cross a picket line to give a lecture on socialism. 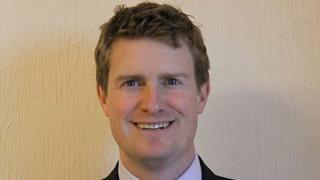 Tristram Hunt teaches history at the Queen Mary University of London. He has been criticised by the University and College Union (UCU) for crossing a picket line on Monday, which was part of a national strike over pay. In a statement, Mr Hunt said: "I support the right to strike for those who have balloted to picket. I have chosen not to join the strike." Mr Hunt, who is also the Labour MP for Stoke-on-Trent Central, said his "personal commitment remained to the students" he was lecturing. The UCU union said Mr Hunt had "snubbed" its picket line to lecture undergraduates taking his "Marx, Engels and the making of Marxism" unit. The union has taken industrial action six times since September after receiving a pay offer of 1%, which it claims would leave members with a "real-terms pay cut" of 13% since 2009. Politics lecturer Dr Lee Jones said while standing on the picket line he had shouted to Mr Hunt suggesting he should not cross. "He looked a bit shame-faced and said 'I'm not a member of UCU' to which I said perhaps you should be," he said. "I'm sure he recognised the irony himself... this is meant to be a Labour Party front-bencher who has decided to cross a picket line of all things." The UCU said it had written to Mr Hunt asking him to explain his actions. General secretary Sally Hunt said: "Thousands of university staff and trade unionists will be so disappointed that he crossed an official picket line. "It is disappointing that Tristram appears to be using his students as an excuse to cross the picket line, particularly since the National Union of Students supports the trade union case for a decent pay rise." The Labour MP for West Bromwich East, Tom Watson, has criticised Mr Hunt for crossing the picket line in his blog. He said he would rather Mr Hunt "resign his post as a lecturer than cross a picket line of striking lecturers, in order to deliver a history module on Marx, Engels and the making of Marxism". "The preposterous irony of Tristram's action will amuse many, but Labour is too near a general election to write a new episode of The Thick of It," he wrote.